Switches are good sensors and are generally understood by most people encountering your invention. They are however a bit cold. You can purchase robust switches with lights and springs built into them from pinball parts suppliers, which can add a bit of color or fun to the system though, remember the notion of the interface and how cultural materials can have culturally associated excess baggage. You may not want your work to be associated with a pinball machine but you also may. The contemporary artist Jason Ditmars uses pinball switches in his work many of which play off the aesthetic of pinball machines. In the image below you see switches that are robust and have lights on the interior so they glow. This can be advantageous in attracting fingers or hands in a dark room and add a bit of zing to the project. 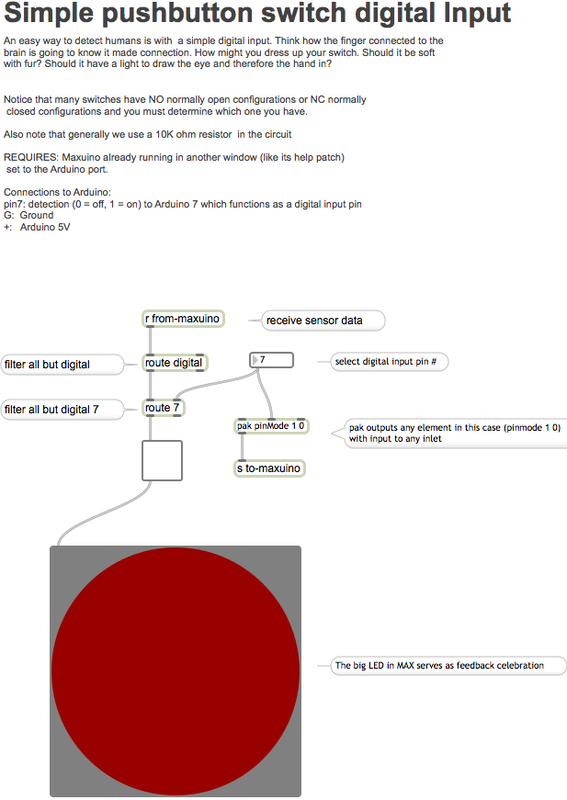 Here is some code on how to use a switch in Maxuino (Arduino controlled by Max Msp and Jitter). Notice the click for more information below does not work in this JOOMLA image though you can search the Arduino website for the switch schematic. 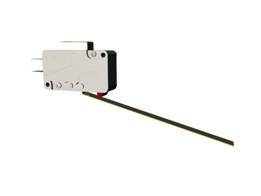 Limit switches are important spring mounted switches that are used as stop devices in motor applications. For instance, if motor travels too far, than the limit switch can cut power to the motor and can be used to send a signal to the microprocessor. They can also be used to create bump switches for mobile robots. 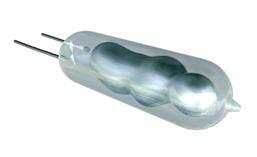 Tilt sensors are sensors with liquid mercury or couple pieces of metal inside a wire cage, which when moved allow contact to be made between two or more wires. 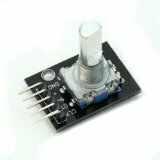 These sensors are not good for high AC voltages however good for DC sensing. They are simple and very easy to use. Tilt sensor tends of be a bit noisy and may need to be debounced with the DEBOUNCE command on the BS2. The Fredericks Company at http://www.frederickscom.com is a good source for a variety of tilt sensors. Spectron is also a good source at http://www.spectronsensors.com/.